Every morning at first light Lily B sounds a call to wake up the rest of his family – his human mother and her current dogs, two small Chihuahuas whose names are Hope and Lucy. The moment he calls “co cooooo,” Hope and Lucy jump out of bed, and I stumble behind them in a daze. The dogs insist it’s time to go out because Lily B woke them up! Occasionally I refuse to get up if I haven’t slept well. When this occurs the dogs come back to bed. But not for long. Lily B repeats his beautiful morning call a few more times, flies to the lamp that has a good view of the cave that we sleep in, and then sails down to the floor and waddles into the dark room. This maneuver always works because Lucy can’t resist chasing him– she leaps out of bed just as Lily soars to the top of the door. By this time I am fully awake, like it or not. 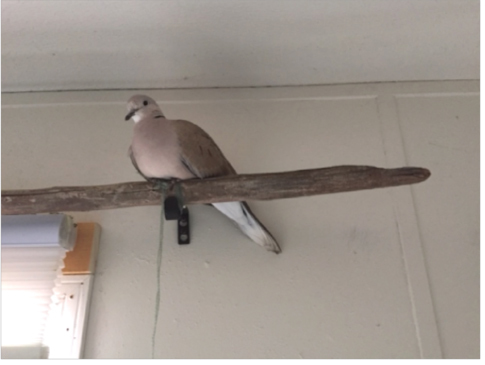 Lily B is an African Collared dove who has lived with me for 24 years. He came to me as a chick and has never been caged. I named him Lily because I thought he was a female and added the “B” for boy when I realized my mistake. Soon after he arrived, I discovered that he preferred to sit on top of the highest furniture in the house, so I hung baskets from the ceiling with newspapers inside them. He loved perching on swinging baskets and it solved the problem of cleaning up after him. About six months together I was forced to acknowledge that Lily B literally read my mind. Whenever I had a new insight he would bellow out his song in approval or validation, repeating his song exactly three times. He doesn’t use this threefold call at any other time. I listened for Lily B’s commentary as I wrote in my journal each morning, even as the rational part of my mind struggled with incredulous doubt. I had always loved doves and had spent many hours watching them as a child and drawing stylized images of them as an adolescent. But it was the sound of their voices that I loved best. I listened with a kind of rapture to their beautiful songs that seemed to flow like water through my body, soothing her through song. It was a relief when I discovered biologist Rupert Sheldrake’s work on telepathy in animals. I no longer felt like I was imagining things. Sheldrake postulates that telepathy is a normal ability found in both humans and animals. Telepathy works as a survival mechanism, functioning as a tool of communication between animals and other animals, humans and other humans, or between animals and humans by keeping them connected. Telepathy works best between those who are emotionally intimate or who have close familial bonds. For example, if one animal is out of calling range of its mate and danger is perceived, that information can be transmitted via telepathic communication almost instantly to the other. The strength of relationship or kinship is the key. Sheldrake hypothesizes that telepathy works through his theory of morphic resonance, where by animals and/or people who share an invisible morphic or bodily “field” can tap into thoughts and feelings of others consciously (mind) or on an unconscious (body) level. Telepathy is not distance dependent but works most efficiently through intimate relationship, human or non-human. As soon as I read that Rupert was looking for apparent telepathic experiences between humans and animals, I sent him a letter describing the seemingly extraordinary connection I had with Lily B. He replied that my anecdotes were exactly the kind of information he was looking for. Lily B’s behavior promptly became part of Rupert’s data bank. It’s important to note that throughout my life I had experienced telepathic behavior between my mother, my brother, my children, various wild and tame animals, plants, and myself, but I had no context and secretly thought I might be crazy until Rupert provided it to me. Now, at age 45, someone, a scientist no less, actually believed me. I was stunned. Meanwhile my life with Lily B continued to amaze me and I continued to record it. When Lily was about five years old I noticed that he began to sing a plaintive new song to the mourning doves outside our house. This song upset me because I felt his distress resonating through my body. That Lily needed a mate seemed obvious. One day he sailed out the door to chase mourning doves. After the shock wore off I felt deeply conflicted; on one hand I was afraid I’d lost him, but on the other I loved the idea that he was truly free. He spent six weeks in the trees flying after one mourning dove or another but was never able to convince a female to join him. His loneliness broke my heart. Curiously he rarely left the yard and every morning he sang up the sun from a lilac bush outside my window. One day I was leaving for work when he flew into a young apple tree just as I was walking to the car. Astonished, I turned around and opened the door to the house, inviting him to come home, and immediately he flew in of his own accord. We spent the following winter in Tucson, Arizona. By accident or design I met a woman who had many doves in an outdoor cage and she invited Lily to join her crowd. By then I knew that he had to choose a mate. After being in the cage for about a half an hour, he chose Fey, a pure white dove. After the two came home they were inseparable. I was so happy for Lily B! Although he continued to read my mind on a regular basis, making his comments in triple calls, I did note that the bond between us seemed less intense. I accepted the loosening of ties gratefully because my beloved bird was clearly ecstatic. Driving back east the following spring with Lily B and Fey perched on a cholla branch in the back seat, we stopped in Indian country for a break. As soon as I opened the car door, Lily B flew out into one of the thick pines… Horrified, I stood there dumbly for a moment. Then a clear thought materialized through thin air: Lily was gathering sticks for a nest. I sat down in the red sand and waited quietly. Within minutes he returned with a mouth full of sticks and sailed through the open car door. Fey was waiting. She pulled a few bits of grass from his mouth placed them on the sheet that covered the baggage below their perch. Lily followed suit and I immediately collected bunches of grasses and small twigs and left them on the back seat to add to Lily B’s offerings. A nest appeared by the end of the day. By the time we returned to the east Fey had laid two eggs. I learned more about fathering from this bird than I ever did from a human. Lily was a devoted parent who incubated the nest each afternoon, while Fey did the rest of the sitting. When the two chicks were born Lily took over, feeding both with regurgitated crop milk. He was tender and sweet, preening the chicks, oblivious to their open mouths and pitiful peeps until he was finished. Then he would feed them again. Fey seemed somewhat detached from her offspring, which surprised me. After the chicks were almost as big as Lily, he suddenly turned on them, forcing both to leave the nest. He used his warning call repeatedly and pecked at their wings until they flew away. It was time for them to be on their own. Anticipating an abrupt ending to fathering, I had made arrangements for the chicks and promptly took them to their new home. When Fey died suddenly the following year I thought Lily would perish from grief. He stopped eating and singing. I frantically tried to find another mate for him. I talked to him constantly but he was so apathetic that I feared I couldn’t reach him. African collared doves are imported to sit on exotic birds’ nests. After the young are born, the doves nurture the young like their own. 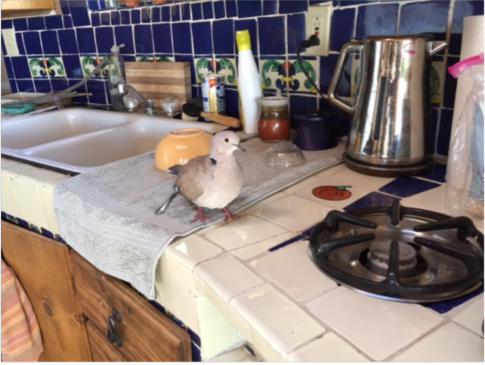 I had a very difficult time finding another collared dove to keep Lily company because these birds were not raised as pets; They are imported periodically to parent other birds. This is when I learned that collared doves are considered “trash birds” by the exotic bird industry. When I presented Mary Anne to Lily, he immediately started singing and bobbing his head up and down, his feathers quivering. By some act of grace, or through telepathy, I had chosen the right bird. Relieved, I finally relaxed my vigil. Lily B rewarded me by bellowing out his song. Within a day he was responding to my thoughts telepathically and all was well. One of the most curious habits Lily B has is that he responds to dreams when I am working with my own, or with others on a professional level. His pattern involves singing (more like bellowing) out his three calls to me if I interpret a dream correctly. Over the years I have come to trust his judgment completely, even when it doesn’t make sense to me. Lily loves classical music, especially when it is accompanied by choral singing. Two of his favorites are the Mozart Requiem and Handel’s Messiah. His favorite folksingers are Joan Baez and Gordon Bok. He also loves earth-based ritual. Ritual is woven into our daily lives; I write my own rituals and celebrate them eight times a year using the Celtic calendar. I also celebrate the full moon each month by honoring my body and the bodies of all living creatures. At each of the eight spokes of the wheel on the calendar, I follow the subtle changing seasons; I give thanks, release what is no longer needed, and set intentions. Lily frequently joins in with his songs. If he thinks, for example, that a particular intention is important, he sounds his triple call. Passionflower vines delight him. He doesn’t like the flowers but tears the leaves to shreds, eating tiny pieces of green. But his favorite plants are orchids. He rips apart the flowers with utter abandon — especially the ones with pink and magenta blossoms — an infuriating habit that I can’t seem to break. I put up a screen to keep him out of the orchids in my window! Torturing people who are afraid of birds is another of his tricks. He somehow knows who is afraid of him and promptly dive-bombs them, causing a great commotion. He also has tormented every dog that I have had by walking around on the floor just in front of them until the dog begins to chase him. Instantly Lily is airborne, and out of reach. Cooking in the kitchen is one of Lily’s favorite daily activities. He investigates all fresh ingredients tearing and pecking at greens and root vegetables with enthusiasm, tasting soups and pasta, all the while keeping one amber eye fastened on me. He is often next to a hot burner and knows enough not to touch it. This penchant for kitchens is how I discovered when Lily B was just a few months old that he loves hard-boiled eggs and cheese. I was particularly curious about these high-protein foods because doves are supposed to be seed eating birds. Yet many other birds often feed their young insects or worms, at least for a time. I began to give Lily chopped egg every morning, a habit we continue to this day. He is very particular about cheese, preferring Brie or Havarti, and every afternoon he flies down to the kitchen counter for his treats. Lily is a very old bird by Collared dove standards, having lived more than twice as long as most of his kind (10 to 12 years), and I often speculate that these protein sources have helped keep him healthy. The loss of Mary Anne seemed to traumatize Lily less than losing Fey. Mary Anne declined slowly over a period of weeks and I sensed that both Lily and I knew we were going to lose her. His behavior towards her shifted. They no longer roosted next to each other and he began flying around without her. Although it was December, the morning she died at least a hundred mourning doves appeared out of nowhere and clustered in one tree outside his favorite window singing their very plaintive song. They were witnessing Lily’s loss. Later that morning, after the doves dispersed, I played the Mozart requiem, sitting just below my silent bird who was perched in his basket. We grieved her loss together, and he watched me cremate her body in the woodstove. The next day I discovered Lucia on the internet. I had a clear thought: This was the right bird. Immediately I printed out a picture of her and put it in one of his favorite spots so he could see her. After I got the news that she was coming to us, I started calling her by name and Lily began to coo excitedly. When she arrived it was love at first sight and the two had the most wonderful time chasing each other through our very happy house! That night they slept huddled close to one another. Lily and Lucia seemed extremely bonded. He taught her how to avoid hitting the mirrors and windows, something he had never done with his other mates. Even their conversation seemed more intimate, with the soft cooing between them almost continuous. If he flew to one basket she followed him. Their favorite spot was swinging in a basket next to the front door, where they could keep an eye on comings and goings. I sensed that neither would fly out, so in the spring and fall, the outside door was almost always left open. I loved the way Lucia answered him when Lily sang to her, imitating his very complex song with ease. As close as they were, the telepathic connection between Lily B and me never ceased, which frankly surprised me. I now thought of Lily B as my animal “familiar” – a guide whose presence graced my life. Lily has become one of my most important teachers. During periods when I suffer from depression, Lily flies around my head to get my attention. Once he succeeds, he sings his triple cooing song. And of course, for a time at least, I am pulled out of unhealthy self-absorption. How can anyone resist this kind of attention? The summer before last, Lucia died suddenly at age seven. The morning I found her on the floor, Lily was standing over her dead body protectively. He looked up at me once, and the anguish that passed between us was palpable. I refused to let Lily grieve alone. I played his favorite music and kept talking to him. My dogs gathered around him, too. I let Lily guide me, leaving her dead body with him until he was ready to leave her. When he finally flew into one of his baskets on the porch, I went out and dug a hole in my flourishing flower garden. He stared at me in silence as I gently placed his mate in the ground just outside the door. I filled in the earth around her body and placed a flat stone on the bare ground to protect the place where she lay. When I re-entered the porch we sat together quietly, no one uttering a sound. After a time I began to coo to him mimicking his threefold call. At first he did not respond. I was trying to convey to him that he still had us – the rest of his family – and that we loved him – I, most of all. I also told him in my mind that this time I was not going to look for another mate unless he indicated to me that he absolutely had to have one, because both of us were getting old… If he died and left a mate, I knew that I would always be comparing a new bird to him. He had a decision to make. Would he choose to live or die? That day I never left the house and Lily’s silence was unnerving. The next morning Lily bellowed out his wake up call. I leapt out of bed to stand below him as I cooed good morning. When he followed me into the kitchen and hopped down on the counter, I knew the crisis had passed. Lily had made his choice. Day after day, Lily attached himself to me like glue, flying into whatever room I was in, watching my every move. Eventually he returned to his favorite basket on the porch and struck up conversations with his favorite neighbor, blue jay. If a mourning dove landed on the sill outside the window Lily would puff up like a blow fish and rasp his territorial call. One morning while walking the dogs I saw feathers scattered on the ground, some with blood on them. Following the trail around the corner I was horrified to see my poor bird huddled under the plywood cover of his cage. His eyes were glazed over and he didn’t respond to my voice. Reaching into the cage I gently gathered my injured bird in my hands and brought him in the house to inspect his wounds. Lily B was in shock. Something had ripped a hole in his flesh and made a three-inch gash that ran from his right eye to his breast. His right eye was swollen shut. Had he been blinded, too. It was Labor Day weekend and I couldn’t reach a vet. The rest of the day and night passed in a blur. I remember nothing except my repeated attempts to comfort him. I couldn’t sleep that night and wept, hoping he would die quickly. The next morning, he was still alive. I made an appointment with a vet for that afternoon. The vet gently took my bird, examined him and told me she could do surgery the next morning. She hoped she could save his life. I left him there, after telling him I loved him, and came home. Lily B survived the surgery. The vet told me that lily B had an incredible will to live. She had never heard of a dove who had lived as long as he had. The next day he came home. When he finally started eating again I allowed myself to hope that he would really survive this trauma. It took about two months for Lily to recover. He never cooed once during that time. And then one morning a miracle occurred. He sang to me once. Overjoyed, I sang back. He peered down at me from his ceiling perch. A day or two later I was writing, when suddenly he cooed three times. The telepathic connection was working again! That was four months ago. Today Lily and I have regular conversations and our telepathic bond keeps us connected even when we are apart. Just within the past couple of weeks, the outdoor birds have started to sing their mating songs. Sometimes wild doves visit the feeder but Lily has lost interest in them. This abrupt change initially baffled me. But his intent is unmistakable; Lily B has chosen me as his partner. 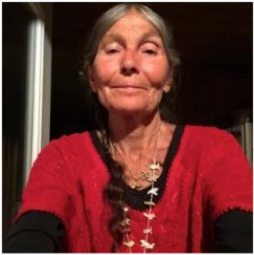 Sara is a writer, naturalist, ethologist (a person who studies animals in their natural habitat), Jungian therapist and animal advocate currently living in the mountains of Northern Mexico. She lives with her two dogs and her bird Lily B, many sagebrush lizards and red winged blackbirds on Red Willow River. She writes for Return to Mago, and her nature columns have been published weekly in The Bethel (Maine) Citizen for the last six years.